One of the most important aspects of app development is user experience. Check out why UX is so crucial for mobile apps. We can all agree that a good user experience (UX) is core to retaining customers to your product. People’s leniency towards below-average UX is continually declining, and they take no shame in deleting an app just moments after downloading if it’s slow to load or unintuitive to use. However, the terminology regarding what makes for good data UX design is somewhat clouded. In this post, we’ll explore what exactly determines ‘good UX’ but first let’s look at what it means (and what it takes) to impress your customer. According to research, it takes all of 7 seconds for us to make our first impressions. As shallow as this may make us seem as humans, we’re of the notion that first impressions are second fiddle to the long-term impression you leave on your audience. Being able to retain your audience’s attention during a presentation, for example, is good – but having them discuss it a week down the line is far more impressive. The goal should always be to get you audience, customer, or whoever it may be thinking in their own time – be that because their experience was particularly appealing or intuitive, it struck a chord with them from the way it was displayed, or because of the content they viewed. Or, even better, all of the above! Taking from that, UX is essentially the experience that user has when they interact with your product. So, by definition, UX design is about the decisions that are made regarding how the user and the product will interact. So, good data UX happens when these decisions are informed and a high level of consideration and time is taken over them, resulting in the data you’re displaying having a bigger impact on your audience. 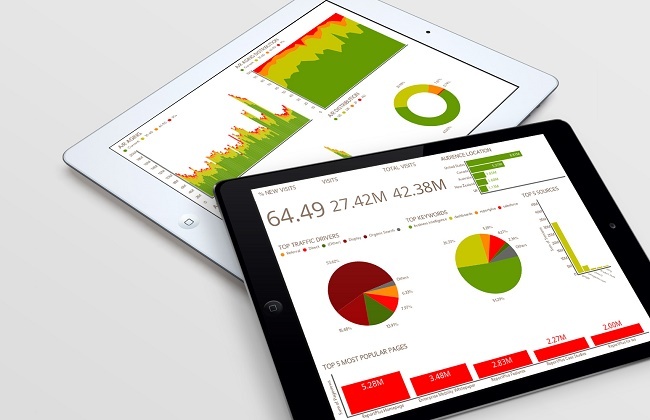 A good data visualization will provide a unique or striking insight into a set of data, drawing up interesting comparisons or differences to show to your customer or viewer. A dashboard is a combination of multiple visualizations on one screen, and so opens up even more possibilities for comparing and contrasting data. Dashboards are a fantastic way to impress your audience, and when combined with an intuitive user experience will ensure to grab their attention. One example of this is social analytics statistics. Coming with the rise of social media in the enterprise, social analytics are becoming increasingly pertinent and popular methods of data analysis. Modern Business Intelligence (BI) tools offer templates for analytics that are popular with the community – be it the latest Facebook, Google or Twitter statistics. Creating a fluid and appealing user experience for your data is extremely important, but just as important is the actual data you put in. So, when it comes to the actual content of your dashboard, there are a few things to be wary of. With such vast quantities of data of different shapes and sizes out there, it’s easy to get lost in the numbers. It’s even more easy, however, to end up over-relying on those numbers. Rolling the behavior of millions into a single number is not always a good thing. Even organized sets of data don’t answer questions in regards to data-driven UX design. These gaps can be filled by qualitative insights or the lesser-known “thick data” - data that provides insights into the everyday lives of consumers, explaining why they have certain preferences and the reasons they behave the way they do. Sometimes, bigger is better. When dealing with something subjective, the more responses you can accumulate the better as it provides greater accuracy and gives you more confidence in your results. However, for some analysis, sheer volume is not the sole answer, and metrics such as variety can also be very important. More diverse sources create a more nuanced picture which can better encapsulate your findings. Perhaps a better analogy is broader is always better. As effective as data can be in expressing your findings, always remember that ‘it’s not gospel’. Datasets are created by humans, who interpret them and assign meaning to them. There are both limitations and at least some level of bias in every type of data, but good data should describe its biases and always provide context. With such ample data out there, making data-driven decisions has never been easier. ReportPlus, from Infragistics, combines the power of data analysis with the appeal of sleek user design in one enterprise tool. Available on major mobile platforms iOS and Android, and soon on desktop and web, users can create the latest compelling data visualizations and share key metrics with their teams, wherever they happen to be.